When it comes time to decorate the house, doubts always arise about the elements and the style that should be assumed. But you can take firm steps if you are guided by the trends that set the tone for this 2020 interior design trends. The need to renew the home paint or choose beautiful furniture for the living room or dining room, not only due to aesthetic reasons. The correct ambience and hygiene of the spaces has a great psychological impact, which translates into physical and emotional well-being. It is precisely that the common point between the 25 trends of decoration that come stomping in 2020. Before starting any reform project in the house, it is convenient that you ask yourself: Do you feel in a good mood when you enter? Do you have ease of movement? Do you perceive tranquility? If your answer to these questions is “no”, perhaps it is time to rethink the location of certain elements, the adoption of new styles or the use of other tones. This small guide will help you make the best decisions based on fashion. Eccentric lamps, textured surfaces and striking ceilings set the tone this season. If you want to add a bit of modernity to your home, pay attention to the 25 trends that are going strong this 2020. Tiles are the right choice for the bathroom or kitchen, but you should not discard them from the main room. Bet on a lot of color and volume in this room. The reliefs and strong colors, as well as the molding in plaster or wallpaper vindicate the importance of the ceiling, the forgotten one of the decoration. Different materials, with complex patterns will triumph this year, especially with marbles of different shades and combinations of wood. Good lighting harmonizes the environments. With beautiful sculptural lamps, this element will not go unnoticed. Always useful, you can join them by making formations of various heights and shapes. As a bedside table, occasional furniture or coffee table, the ceramic stools make the difference, especially if you group them. A beautiful bust of vibrant hue, will surprise in your decoration. This handmade piece, used for magic in the indigenous culture, has a warm and soft texture that is currently used for decoration. The golden one is the great protagonist of the taps and the sconces. You will find a great variety of ways in the marking, that adapt to what you need. The mirrors help to multiply the natural light of any area, but above all, they allow to visually enlarge a small space. Those of wide and prominent aspect are tendency. The grid gains strength with a more sophisticated touch. It is suitable for screens, cabinets, cabinets, chairs and armchairs. This 2020 takes force the Chinese style, signed by the use of Chinese ornamentation. The contrast of shades such as red, yellow and copper jumps to the eye, as well as the use of solid wood furniture, vases, vessels and tea sets, among other elements. Bonsais, candles, tables and low tables complement the whole. We shook the Nordic furniture and embraced the pieces of French and Italian style with velvety upholstery, rebellious colors and glossy lacquers. The cozy luxury is the premise. Without a doubt, the preferred one in terms of elegance. The medium-sized ones look very well making geometric figures on floors and walls. This technique returns with strength, but using bold colors and creating much more fun compositions on the walls. You can create continuity in floor and walls, or add small touches, mosaic style. If you are looking for a sober and elegant look, the mix of grays will please you. Very current, it is represented by the union of the millennial pink, the yellow pineapple and the aquamarine, the key is in the combination. A true ally for redecorating your home. Those that evoke magical or tropical landscapes are the most sought after. Clean oxygen and beauty, is there anything better? Try the exotic bushes like: palm trees, banana tree or a succulent. Although the wild still attracts attention, the colors have calmed down and the exaggerations no longer delight. Try less strident. 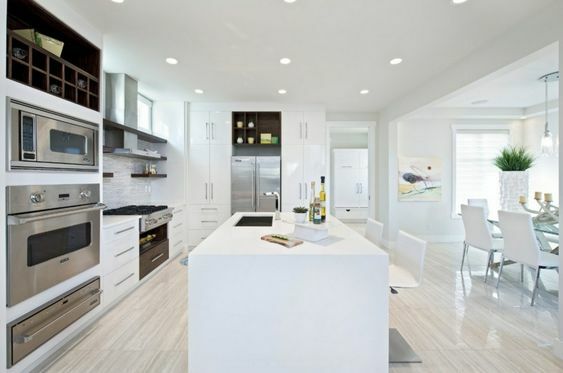 The kitchens “Total White” are still very interesting, but mixed with yellow or pearl gray furniture will be a sensation. The navy blue and green are other very striking additions. It may not be your type, but do not dismiss it. The secret is its wide range, which prints warmth, modernity or softness, according to your wishes. Ideal for furniture, walls and accessories, which sometimes changes to green and others to blue, depending on the light. It will steal all eyes! Together with his faithful companion, the aquamarine green, it causes sighs in those who see it. Both will be successful if you live in a cold place. If it is confused with black, it is the right one for this 2020. Sobriety and elegance are the words that define it. It works well for bathrooms, kitchens and walls that require depth. It is perfect for any time of the year. In addition, it is a rather “sweet” color, which gives joy to any home. According to the needs of your environment, these 25 trends that are going strong in 2020 may give a turn to your decor. Expand your horizons discovering what takes place in 2020 in home textiles.